Love Bug Living: Camera Strap for the new Camera! Camera Strap for the new Camera! It feels like I have been saving forever for my first DSLR camera! I've always loved photography and made it a hobby of mine. I even took a class in college where we had to develop our own film. I spent many evenings in a quiet and kind of scary darkroom. I have to say that It was NOT easy! I'm very grateful for my photo processing centers and digital cameras! Now after saving up lots of birthday money and selling lots of outgrown baby items at a consignment sale, I finally had enough money to buy my new camera! So excited! I'm sure my father-in-law is as well since I have hijacked his camera for quite a while. 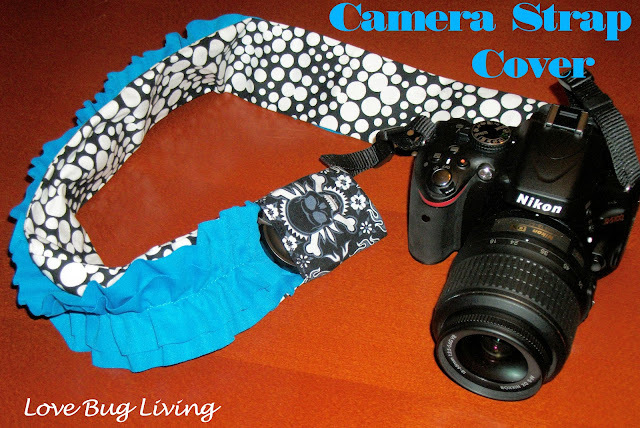 Of course now that I have my camera, my first project would have to be something to make it even prettier, a camera strap!! I love the ruffle straps and I had to have one with a lens cap pocket. I'm always setting that thing down and then having to back track to find it. So a pocket was a necessity. I started off by looking for a tutorial to make one. The obvious place to start was to search Pinterest and of course I found the perfect one. I used the tutorial HERE by Raechel Myers. Very easy to follow. 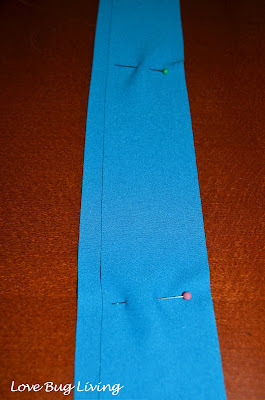 You will need a piece of fabric 6" wide by 30" long for your strap. 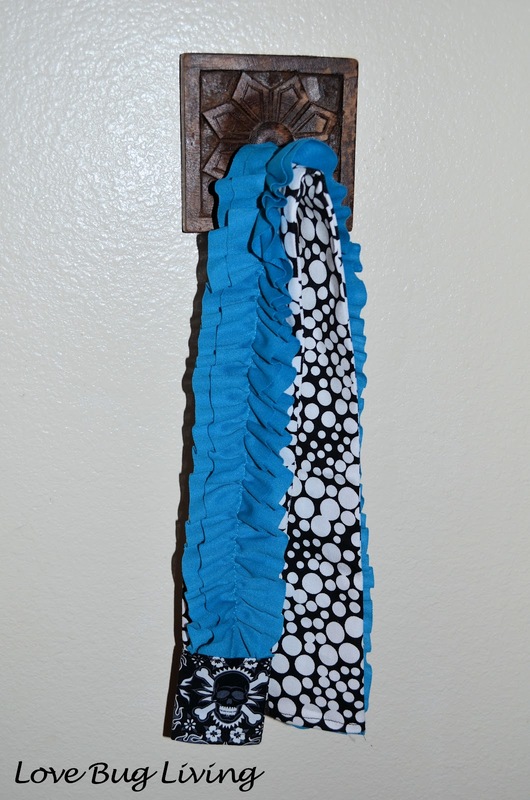 For the ruffle you will need two pieces of jersey fabric 1.75" x 60" and 2.5" x 60". 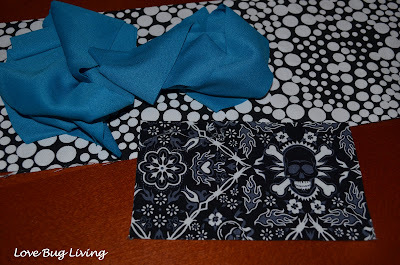 Jersey fabric works great because it doesn't ravel. If you like the raveled look, you can use any cotton. If you would like a pocket, you will need a piece of fabric 6" x 3.5". 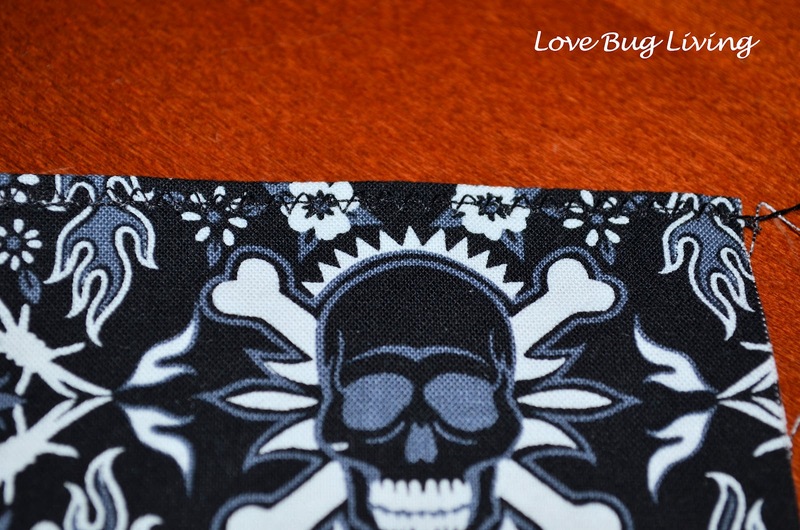 This can be in a coordinating fabric or the same material as your strap. On the top of your strap material, measure in 1.75" from one side and draw a line down the length of the fabric. 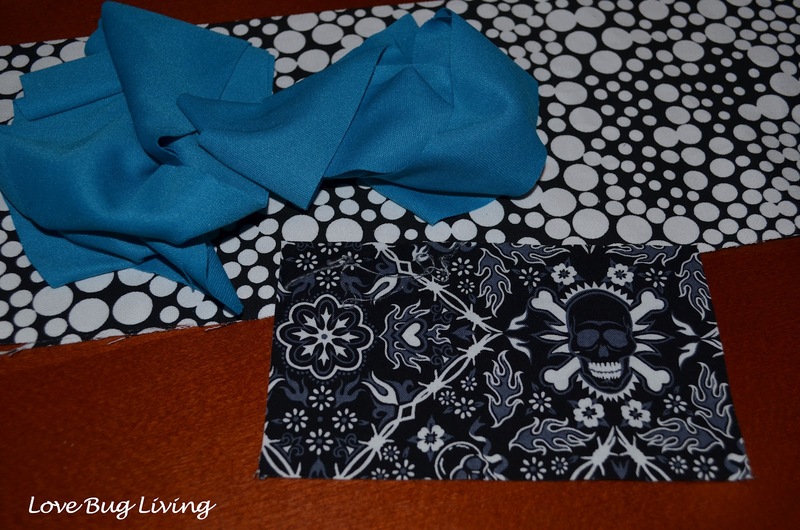 This will be the sew line for your ruffle. 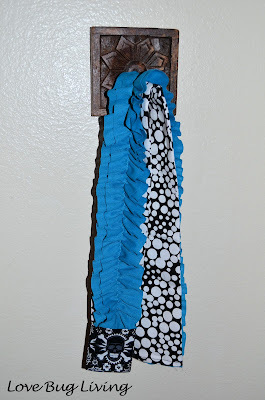 Now it's time to make your ruffle. 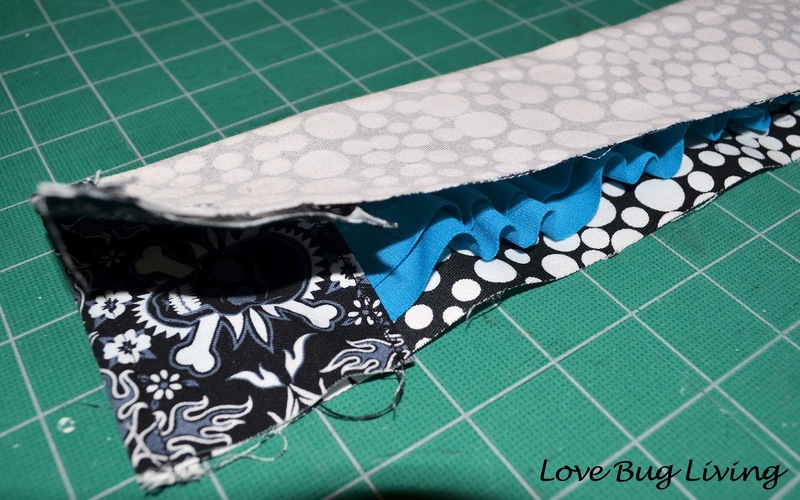 Stack your two ruffle lengths on top of each other, smaller one on top. 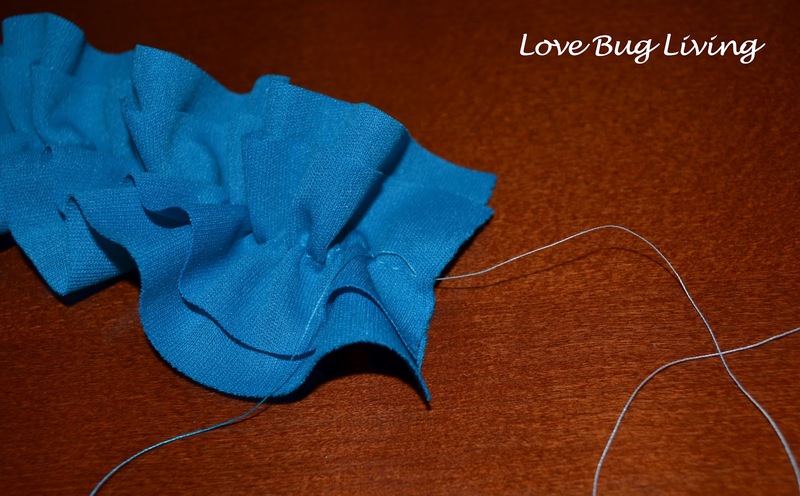 Use matching thread for the top thread and white thread in your bobbin. Set your stitch length to five so that they are long. 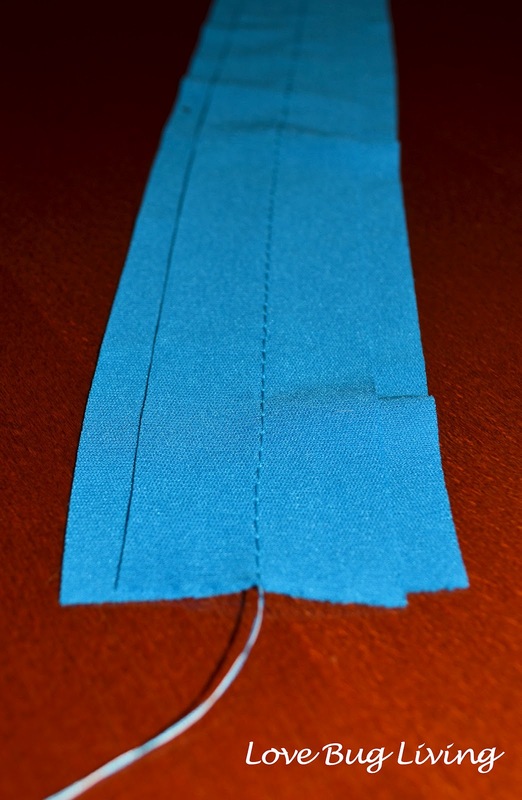 Sew a seam down the middle of your two fabrics. Do not back stitch. After you have your seam, hold the white thread and pull to create your ruffle. 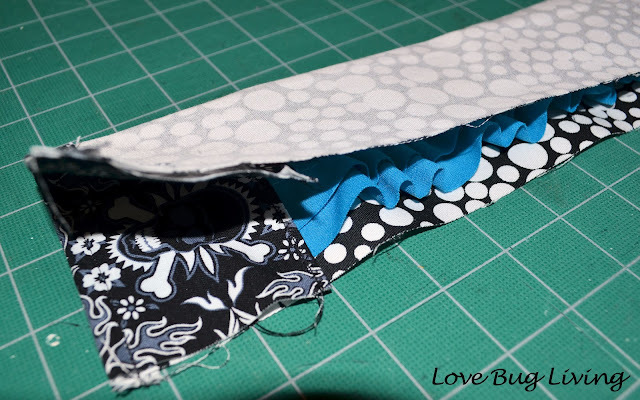 Space your ruffles out evenly, making it the same length as your strap fabric. 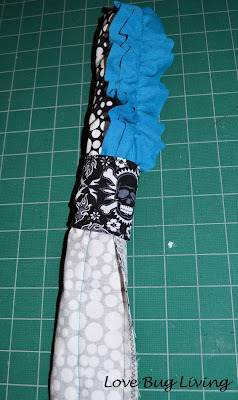 In order to make it easier to add your pocket, leave 3" at one end of your ruffle material smooth. 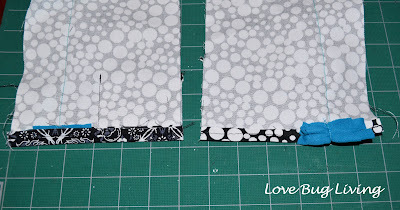 If you aren't creating a pocket, you can make the whole piece ruffled evenly. Now it's time to create your pocket. 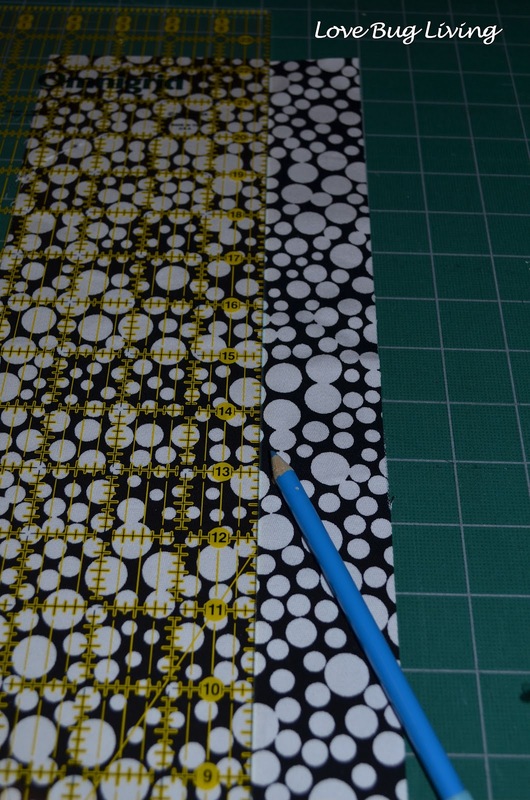 Your pocket piece should measure 6" x 3.5" with the top being the long edge. 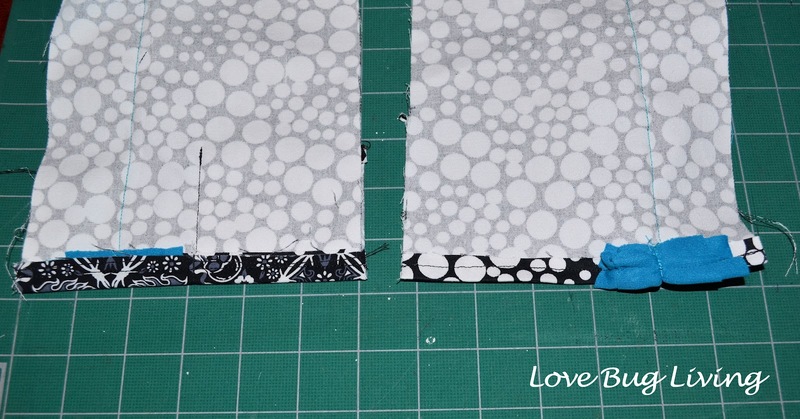 Fold over the top edge 1/2" and press. Sew in place. Place your pocket piece over one end of your strap. This will be the end that you left the ruffle material smooth. Pin in place. Stitch across the bottom with 1/8" seam allowance, just to keep the piece in place. 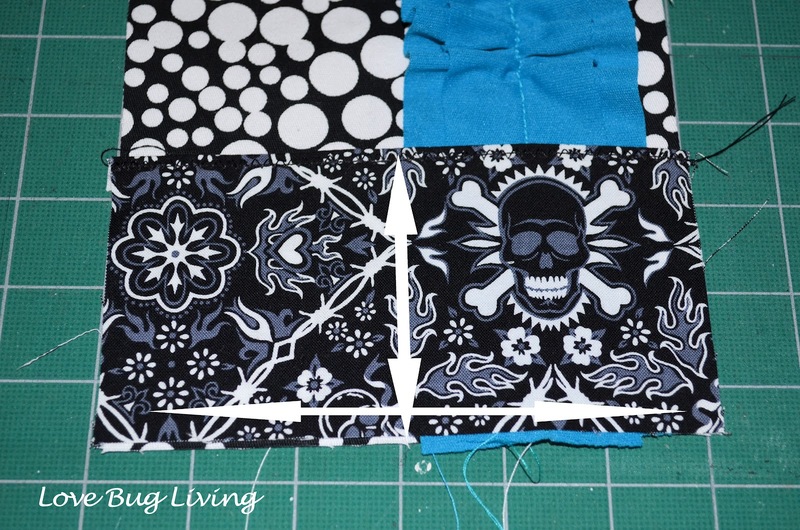 Next stitch a seam up the center, backstitching at the top of your pocket piece for extra strength. 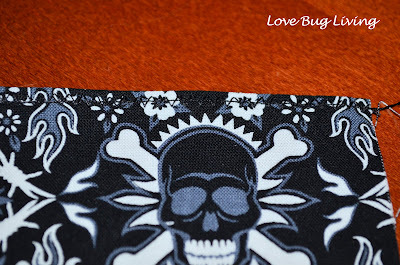 Now you will want to hem both ends of your strap material. 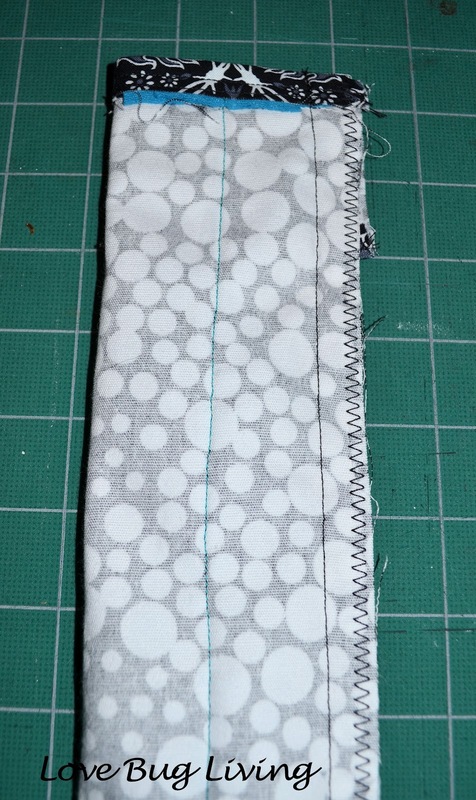 Fold over the ends 1/2" towards the back and press. Stitch in place. Now fold your strap material in half longways and pin together. Sew a seam up the side with a 1/2" seam allowance. 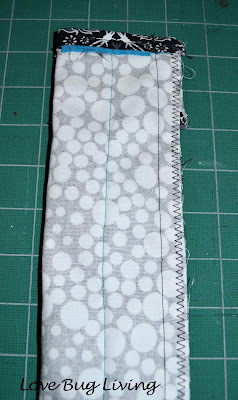 I pushed the ruffle material out of the way as I stitched so that it would not get caught in my seam. 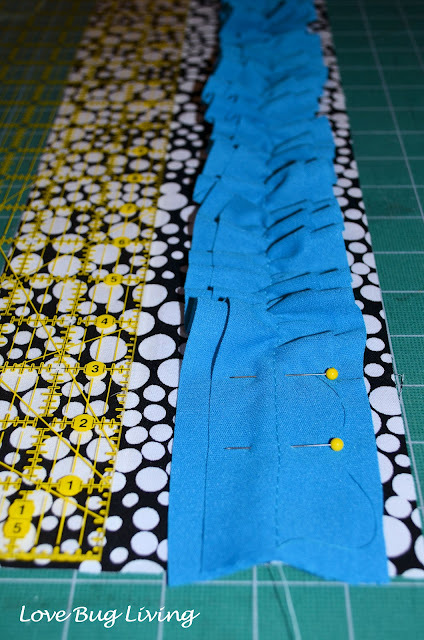 Finish off this seam with your serger or a zig zag stitch. This will keep it from raveling. Now turn your strap right side out. We are almost done!! Your strap may look a little off once you turn it right side out. Don't worry, it just needs to be ironed. Don't bother ironing the ruffle, just lift it out of the way and press the strap material. Now you can just slide it on to your camera strap. That lens cap has its own spot now for when you are snapping pictures. Slip it into the pocket and you will never misplace it. What a transformation! 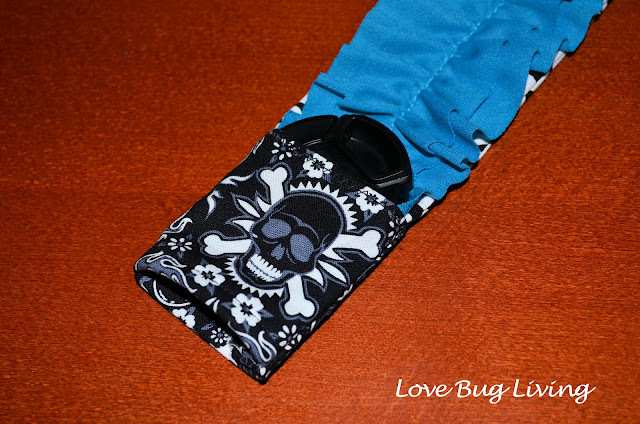 A plain, boring strap now has a new personality! I love having a fun strap cover. I may just have to make a couple more! That is gorgeous! I'd love for you to add it on my link party at: http://printabelle.com/?p=3188 Thanks! Love this! What a great easy-to-follow tutorial! 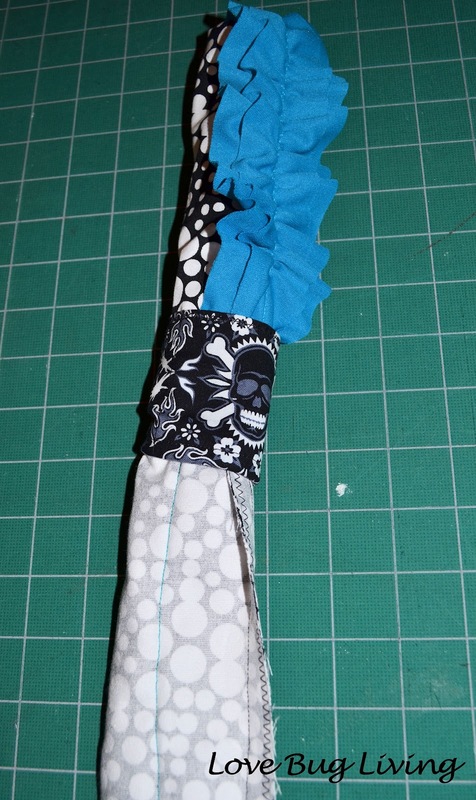 I've been meaning to make a camera strap cover and this is just the motivation I needed! Love it... wish my camera was all dressed up in one! Yay I love this!! I just got a new Nikon too! (for mother'd day) This is something I truly want and need :)I love the ruffle. That turned out so cute! We would love for you to come share it at our weekly link party and enter to win a $50 gift card to Mikarose Clothing!